Earlier this week, we told you about the NewFront advertiser presentation for “Stadium,” the emerging network that will launch later this year, first online in July and on TV in August. While a lot of programming will be filled by studio shows, the bread and butter for Stadium will be live sports. If you’ve been following our coverage of Stadium, it’s a consortium of three media companies, Silver Chalice (Campus Insiders), 120 Sports and Sinclair Broadcasting. 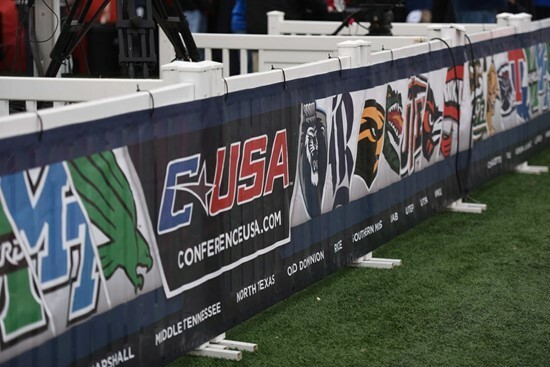 This week, Conference USA which partnered with Stadium’s predecessor, American Sports Network and Campus Insiders, will continue by scheduling some 15 games on the network. Stadium will be streamed 24/7 on Twitter and also on TV through Sinclair’s vast number of stations across the country. Saturday, September 2 — Alabama A&M at UAB, 3:30 p.m.
Saturday, September 2 — Houston at Texas-San Antonio, 7 p.m.
Saturday, September 9 — Southern at Southern Mississippi, 7 p.m.
Saturday, September 16 — North Carolina at Old Dominion, 3;30 p.m.
Saturday, September 16 — Louisiana Tech at Western Kentucky, 7 p.m.
Saturday, September 23 — Ball State at Western Kentucky, 7 p.m.
Saturday, September 30 — Middle Tennessee at Florida Atlantic, 7 p.m.
Saturday, October 7 — Florida Atlantic at Old Dominion, 6 p.m.
Saturday, October 14 — UTEP at Southern Mississippi, 7 p.m.
Satuday, October 21 — Southern Mississippi at Louisiana Tech, 7 p.m.
Saturday, October 28 — Florida Atlantic at Western Kentucky, 4:30 p.m.
Saturday, November 4 — Texas-San Antonio at Florida International, 7 p.m.
Saturday, November 11 — Florida Atlantic at Louisiana Tech, 3:30 p.m.
Saturday, November 18 — Florida International at Florida Atlantic, 7 p.m.
Saturday, November 25 — Southern Mississippi at Marshall, 2:30 p.m. Overall, Stadium will air fifteen games, ten of which will be played at night. Conference USA’s other TV partners include ESPN (ESPN/ESPNU), CBS Sports Network and beIN Sports. In addition to the TV partners, C-USA plans to stream games on ESPN3, Facebook Live and on Twitter. The conference’s season kicks off in Australia when Rice takes on Stanford from the Pac-12 in Sydney on ESPN. And Stadium will be featured prominently with ten primetime games.